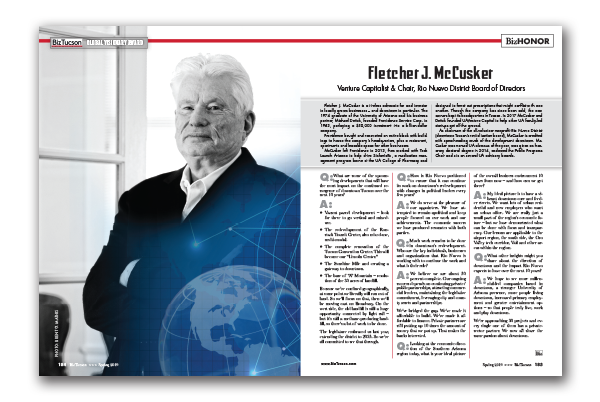 Fletcher J. McCusker is a tireless advocate for and investor in locally grown businesses – and downtown in particular. The 1974 graduate of the University of Arizona and his business partner, Michael Deitch, founded Providence Service Corp. in 1983, parlaying a $50,000 investment into a billion-dollar company. Providence bought and renovated an entire block with buildings to house the company’s headquarters, plus a restaurant, apartments and leasable space for other businesses. McCusker left Providence in 2013, then worked with Tech Launch Arizona to help drive SinfoníaRx, a medication management program borne at the UA College of Pharmacy and designed to ferret out prescriptions that might conflict with one another. Though the company has since been sold, the new owners kept its headquarters in Tucson. In 2017 McCusker and Deitch founded UAVenture Capital to help other UA faculty-led startups get off the ground. As chairman of the all-volunteer nonprofit Rio Nuevo District (downtown Tucson’s revitalization board), McCusker is credited with spearheading much of the development downtown. McCusker was named UA alumnus of the year, was given an honorary doctoral degree in 2014, endowed the Public Programs Chair and sits on several UA advisory boards. Q: What are some of the upcoming developments that will have the most impact on the continued resurgence of downtown Tucson over the next 10 years? • Vacant parcel development – look for these to go vertical and mixed-use. • The redevelopment of the Ronstadt Transit Center, also mixed-use, multi-modal. • The Sunshine Mile and creating a gateway to downtown. • The base of “A” Mountain – resolution of the 30 acres of landfill. Because we’re confined geographically, at some point we literally will run out of land. So we’ll focus on that, then we’ll be moving east on Broadway. On the west side, the old landfill is still a huge opportunity connected by light rail – but it’s still a methane-producing landfill, so there’s a lot of work to be done. The legislature embraced us last year, extending the district to 2035. So we’re all committed to see that through. Q: How is Rio Nuevo positioned to ensure that it can continue its work on downtown’s redevelopment with changes in political leaders every few years? A: We do serve at the pleasure of our appointers. We have attempted to remain apolitical and keep people focused on our work and our achievements. The economic success we have produced resonates with both parties. Q: Much work remains to be done in downtown’s redevelopment. Who are the key individuals, businesses and organizations that Rio Nuevo is working with to continue the work and what is their role? A: We believe we are about 50 percent complete. Our ongoing success depends on continuing private/public partnerships, attracting commercial lenders, maintaining the legislative commitment, leveraging city and county assets and partnerships. We’ve bridged the gap. We’ve made it affordable to build. We’ve made it affordable to finance. Private partners are still putting up 10 times the amount of money that we put up. That makes the banks interested. A: My ideal picture is to have a vibrant downtown core and feeder streets. We want lots of urban residential and new employers who want an urban office. We are really just a small part of the region’s economic future – but we have demonstrated what can be done with focus and transparency. Our lessons are applicable to the airport region, the south side, the Oro Valley tech corridor, Vail and other areas within the region. Q: What other insights might you share about the direction of downtown and the impact Rio Nuevo expects to have over the next 10 years? A: We hope to see more millennial-led companies based in downtown, a stronger University of Arizona presence, more people living downtown, increased primary employment and greater entertainment options – so that people truly live, work and play downtown. We’re approaching 30 projects and every single one of them has a private-sector partner. We now all share the same passion about downtown.